Public awareness of mass incarceration has grown in recent years thanks to groundbreaking books and activism from groups like Black Lives Matter. One aspect of this growing awareness has been an increased understanding of racial disparity in the criminal justice system. In 2010, white people were incarcerated at a rate of 450 per 100,000 while black people were incarcerated at a rate of 2,306 per 100,000. In my paper, I attempt to contribute to this debate by calculating the racial and class disparities in incarceration as well as the interaction between the two. Below are the key findings of my analysis. For all four incarceration outcomes, being lower class rather than middle or upper class makes a massive difference. Being black rather than white makes a modest difference that is statistically insignificant for all outcomes except one: the probability of being in jail or prison for more than a year. And even in that case, whites in the lowest class group are more likely to have been incarcerated for more than a year than blacks in the second-to-lowest class group. 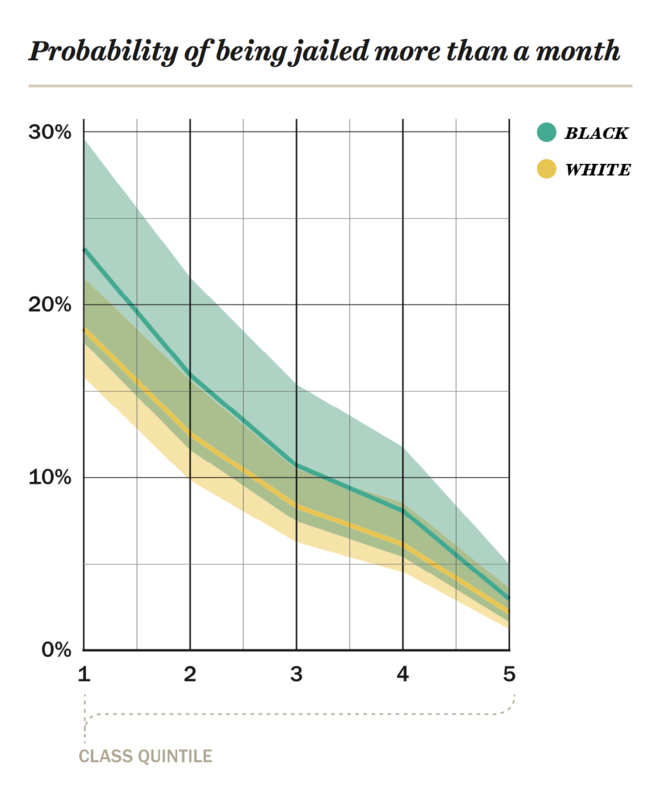 Thus the primary reason why there is such a big overall gap in black and white incarceration rates appears to be differences in the class composition of each racial group. 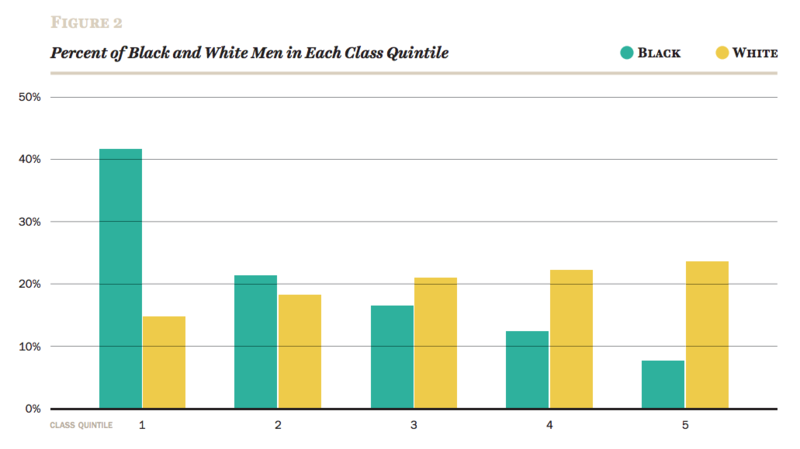 Figure 2 shows how the black and white men used in our analysis are distributed across the class spectrum. Forty-two percent of black men were in the lowest class group versus just 15 percent of white men; and 24 percent of white men were in the highest class group, versus just 8 percent of black men. 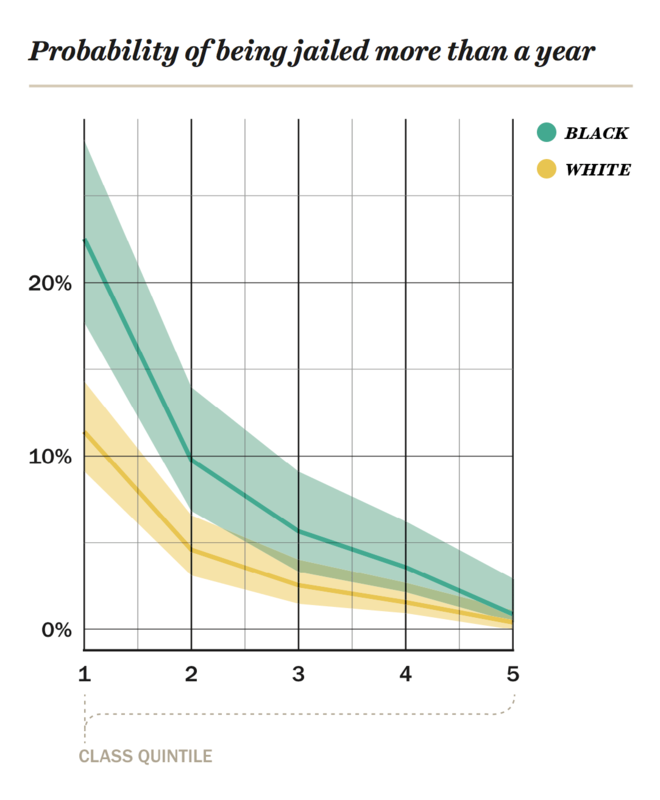 To see how much class explains the overall racial disparity for each incarceration outcome, I constructed a counterfactual scenario which eliminates the class differences among white and black men. 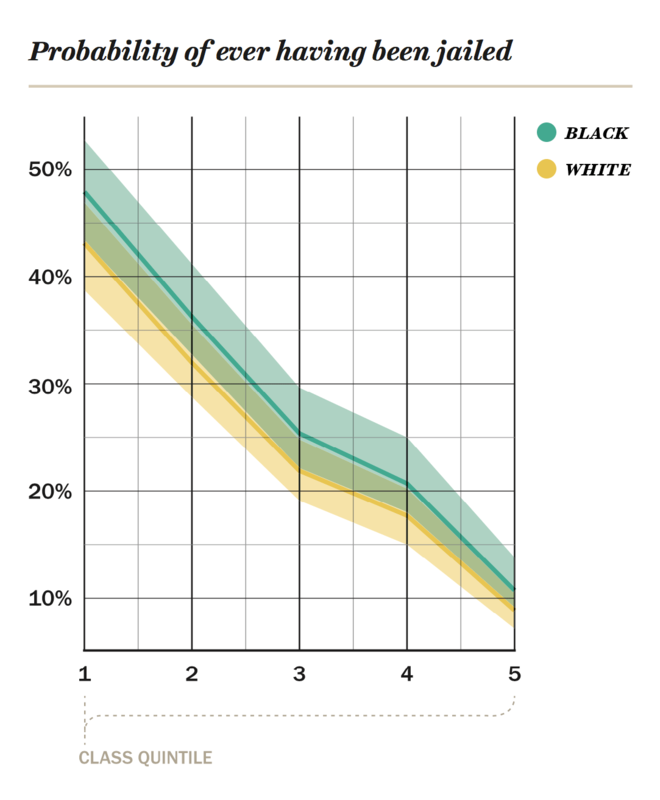 We can examine this by changing the bars in Figure 2 so that 20 percent of black and white men were in each of the five class groups while holding all else equal. 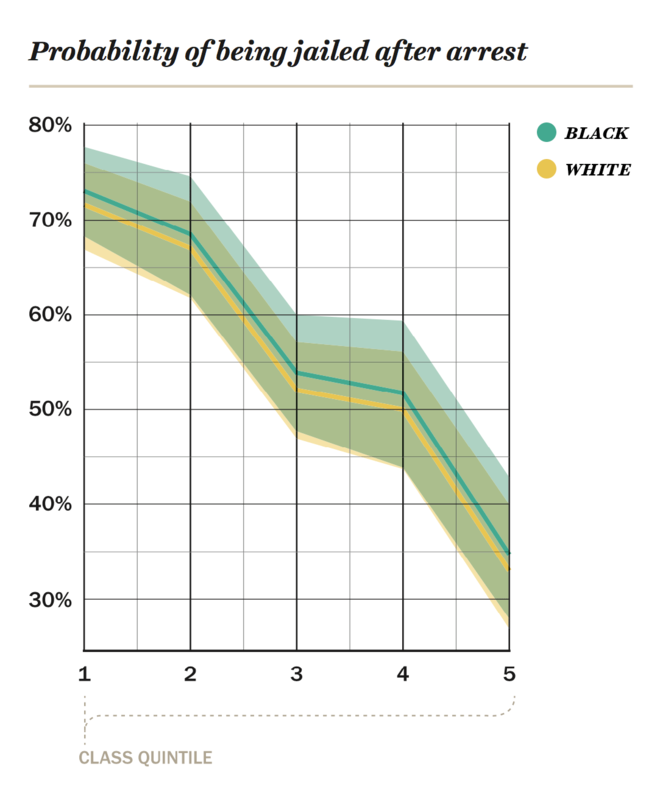 Figure 3 shows the difference this makes: the overall black-white gap falls anywhere from 53.7 to 84.8 percent depending on the incarceration outcome being tested. Overall, this study supports the view of Cedric Johnson and others that mass incarceration in the United States is primarily a system of locking up lower class men—one which ends up disproportionately imprisoning black men, since they are far more likely to be lower class than white men. Racial disparities remain among certain incarceration outcomes, which are consistent with findings of other studies on this topic, but it is nevertheless class that is the predominant factor. Understanding this reality is important for policymakers interested in rolling back the American carceral state. While racial discrimination and bias are clearly present in various aspects of the criminal justice system, eliminating that bias will not effectively reduce the racial disparities of mass incarceration. This is because these disparities are primarily driven by our racialized class system. 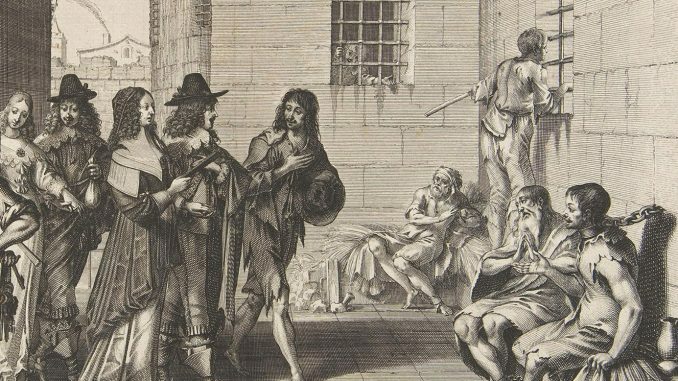 Therefore, the most effective criminal justice reform may be an egalitarian economic program aimed at flattening the material differences between the classes. The Week: How do you fight racism in the criminal justice system? With brute-force economic policy. 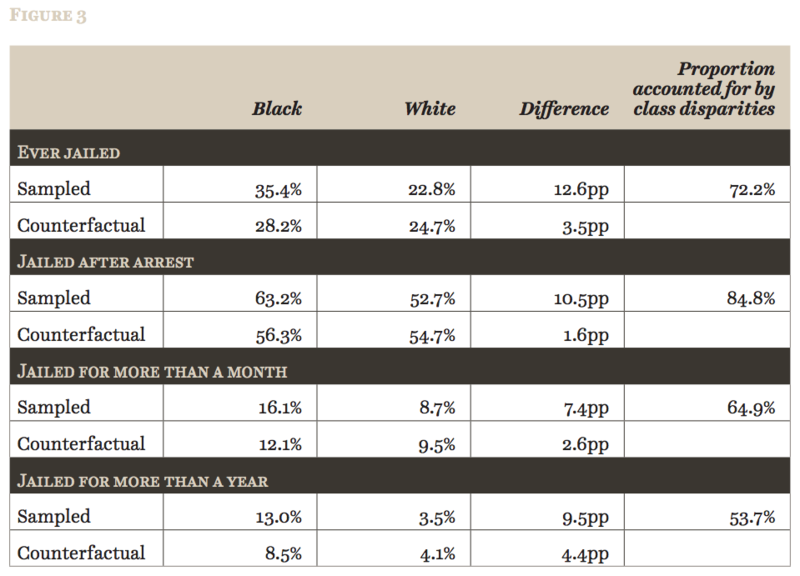 The Intercept: New Report Finds Class Is a More Potent Predictor of Incarceration Than Race. But Racism Drives It.